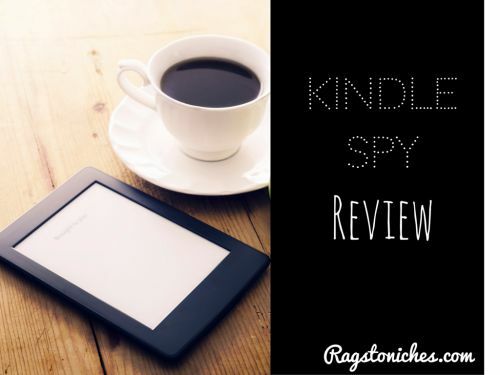 Kindle Spy Review – Spy On The Competition! Last updated on August 30, 2018 By Nat 8 Comments This post may contain affiliate links. We appreciate you supporting Rags To Niches! Full disclosure here. Kindle Spy Review – SPY On Your Competition! It goes without saying that if you want to make money on kindle, you need to research your competition. So, it’s pretty cool that you can now get software to do some of the hard work! Could Kindle Spy help you with your kindle book research? Is it worth the money? Mini Review: This is an excellent tool for helping you discover low-competition niches & keywords for your next ebook – as well as SPY on your competition! It is so simple to use and vital for research! If you’re wanting to succeed in self-publishing online, this could be your secret weapon. Just as with a niche website, you need to choose your Ebook niche wisely. If you put out a book where no one is buying in that area, obviously you won’t get any sales and it will be a waste of your time! Similarly, release a book in a niche that’s completely swamped and is overly competitive, you’re going to struggle too. Having decent software to help you research your market, turns something that feels like a giant chore, into something really enjoyable and easy. The best bit about Kindle Spy: you get to snoop on your competitors and see exactly how many books they’re selling and how much money they’re bringing in from their books. I was actually continuously shocked when I started using this software – because I didn’t expect to see authors making quite so much money! On the other hand, some books are bringing in zero profit, so it really pays to do your research – this software literally saves hours upon hours of time! What Is Kindle Spy & How Do You Use It? Kindle spy is a really neat clever bit of software that sits on your toolbar and is easily accessible. 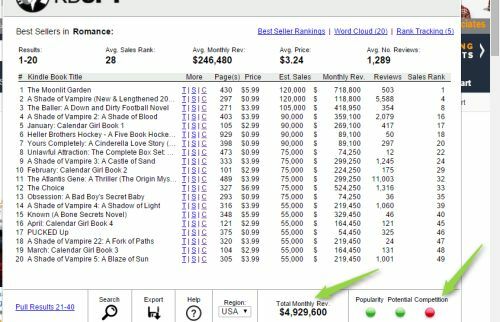 1) to get data about the best sellers in a certain niche. 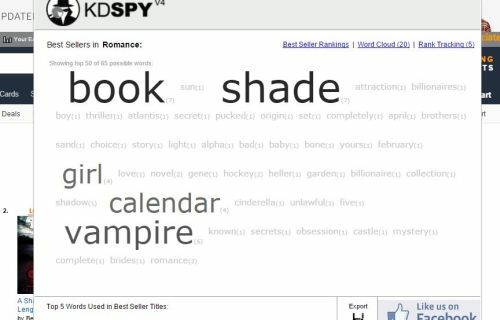 For example, I’d go to the “romance” section, then to “best sellers.” Then I’d click on my kindle spy icon and it starts to pull up data. At the bottom of your kindle spy window, there is also a traffic light system that will give ranks in terms of popularity, income potential and how competitive the niche is. So, we can see in the above example, (check out the green arrows) that romance is both popular and has good earning potential, (two green lights showing) but it is also highly competitive, (red light). what are the titles like? Are there recurring themes that are selling more? What is the average sales rank in Amazon for the top sellers in this niche? How many reviews do the top sellers have? We will be able to weigh up whether it would be worth our while trying to compete within the niche. Lets say we’re looking at a very popular niche. The top authors may be making hundreds of thousands of dollars every month. But, even if we conclude that there is little chance we can compete in a highly competitive niche right now, we may still decide to choose it anyway if we have a good marketing strategy for our book. If you click the “word cloud” tag at the top right hand side of the program, it also lists some key words that are coming up regularly and this can give you some ideas about what potential topics and keywords to target. 2) Another way I like to use kindle spy is to actually spy on particular authors. You can check which of their books are making the most money and learn something from that data – why are certain books more popular than others? Is a particular topic making more sales? Are certain keywords making more sales? …and so on! In the above example, I’m looking at one particular children’s book author. 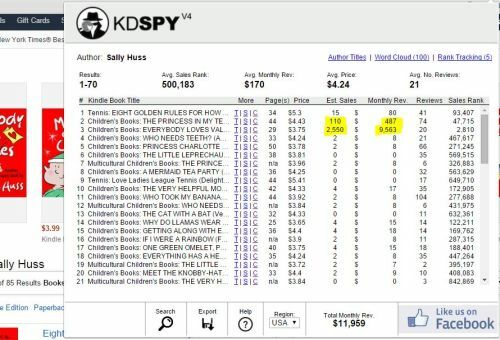 As you can see, (in the section I’ve highlighted yellow) one main books there is making a majority of her sales. The book in question is actually about valentines day — As it’s currently late January, it may be it’s proximity to Valentines day that accounts for those sales in the last 30 days. This could tell me that writing books around certain times of year, (Halloween, Easter, Christmas and so on…) could be very profitable in the Children’s book niche. Her second most profitable book is about a princess, so maybe I would want to go out other princess related books and see how they’re doing too…. you get the idea! 3) I use it to check out a certain keyword that I’m considering targeting. 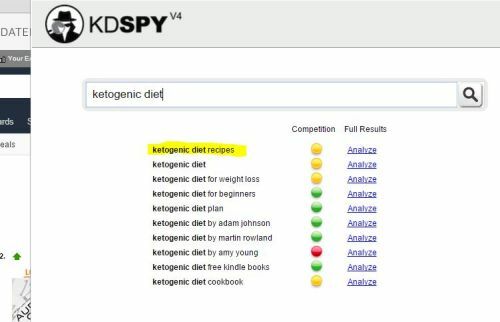 Looking further, I can see that it’s a keyword with a medium level of popularity, potential and competition across the board, (see the three yellow circles at the bottom of the kindle spy window). Since I’m probably looking for a high level of popularity and potential, I may choose to target a different keyword. Although, you can see from some of these titles that they are selling a good amount without a huge amount of reviews. One book that has made over $6,000 in revenue, only has 17 reviews and so you may choose to dig further from here into the author profile. You could check the inside of the book and check the book length, in order to determine if it’s a niche you think you could compete in. 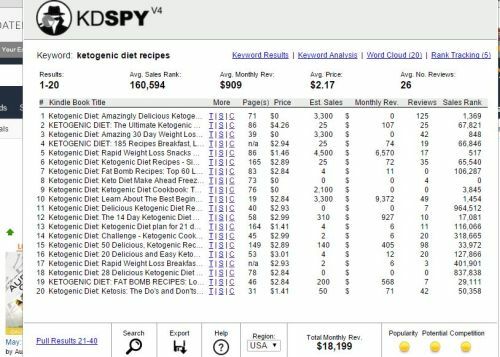 Simple to use: Kindle spy is incredibly simple to use, you can access data very quickly and efficiently and it really makes researching niches fun and simple to do. Spy on your competition: It’s a great to be able to spy on individual authors and really get a feel for what sort of books may be profitable and worth targeting. Multi-dimensional tool: There are several ways you can explore competition, niches and keywords and so it’s not a one dimensional tool, there is a variety of data you can analyse. Accessibility/Ease of use: Kindle spy is always accessible, as it sits neatly on your toolbar, so there is a great ease of use. Minor Learning Curve: The software takes a bit of getting used to initially – at first I would tend to click for data in sections where there was no data available. I got used to it very quickly however. Occasionally No Data: Infrequently, it may also pull no data when it should do – for me, often coming out of the program or refreshing the page and starting over can help. Ultimately, making sure you watch the kindle spy instructional video first and you will have no problems. Kindle Spy is an absolute must have tool for anyone looking to get into self-publishing on kindle. It gives you plenty of data at the click of a button, is a breeze to use and is great value too. It will save you a ridiculous amount of time researching niches and analysing competition and, a great bonus is, it’s really fun to use. You may well end up spending hours on it, just because it’s interesting to find out what niches are selling and snooping on what some of these successful self-published authors are making! Ultimately, using Kindle Spy ill give you the best chance of selling your books, by choosing the right niche and you’ll have a massive advantage over your competition right from the start. If you’re thinking of getting into Kindle publishing, or have already started, I strongly recommend you check this out. Click Here To Access Kindle Spy! Have you written any Ebook yet, or are you just thinking about writing your first book? If you’re interested in writing ebooks for kindle, you might also be interested in reading my Kindle money mastery review – a course that teaches you step-by-step how to create and publish books on kindle. Additionally, this kindle software can make managing your kindle books much easier. 14 ways to make money from a WordPress site. How to find content writers on a budget. 40 ways to make an income online. My sister just ventured into the world of writing ebooks to sell on Amazon. I’m going to send her a link to this article. Writing an ebook is a huge investment of time. It makes sense to backwards plan your way into the right niche. I had no idea there was a tool to research the market, trends and competition. Great review. Thanks so much! Hi there! It does take a huge time investment, you’re right. Having a tool like this makes the whole process so much easier, (and fun!). It’s a really fun tool and incredibly good value in my opinion. She might want to also check out the K-Money Mastery course too. Thanks for your comment! To be honest I didn’t realise it was that easy to release books to be available for download on the kindle. If you’re an avid/ budding writer I think this would be a great way to work out where you can earn money. I’ve written a number of ebooks over the years so I’ll probably buy this software myself and work out where I can potentially get some sales for my older or brand new stuff! Great Nate, yep it’s certainly easy these days… but because of that, the competition is ever-growing. You do have the upper hand if you’ve researched the market correctly prior to releasing your book and work on promoting it. The best of luck to you! I read your post with deep interest! I want to self publish a book this year but I didn’t know wehere to start. So your review of Kindle spy was really nice and complete because I had a clear vision of pros and cons of this tool. It costs $49, but if you want to publish books and have potentially success, I think it’s a worthy Investment. I’ll have a look at it. Thanks for your helpful review! I didn’t get my kindle spy application after I payed.